For Day 19 of the 30 Day Coloring Challenge with Kathy Racoosin. Another quick post today. 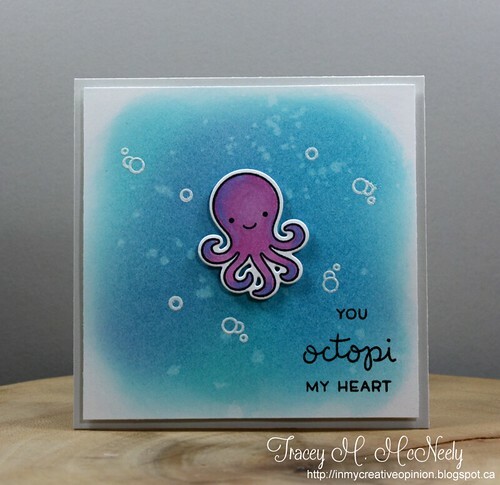 I love this cute little octopus from Lawn Fawn. I coloured him with Copic markers--V01, RV63, B00 and BG01. The background was created by white heat embosing some water bubbles and then sponging Distress Inks onto Bristol cardstock. Then I splattered a bit of water on it patted it with some paper towel. The octopus was added with a bit of foam tape. Sweet Tracey. I love the colors you used on this guy. And I adore the emobossed bubbles on your gorgeous sponged background. Tracey, this is adorable. I love the colors! wow! love that coloring and the blue and purple! He is so cute!! I adore the way you created the water on this!! great blending!! It does not get any cuter than this! Love it. Oh Tracey, that is adorable.Love the blue with the putple. This is SO adorable! I love the colors you used and that bubbly water! Simply adorable with an awesome background ! 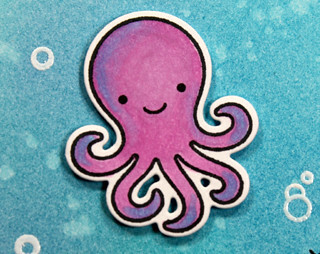 Wonderfully done background for your cute little octopus!